Cape Town is the second largest city in South Africa and one of the nation’s cultural and economic centers. Before the arrival of Europeans, the area was inhabited by San and Khoikhoi peoples. In 1652, Jan van Riebeeck established a small colony on the Cape of Good Hope as a refreshment station for the Dutch East India Company. The station soon became a town as Dutch settlers, attracted by the area’s climate that made the cultivation of European crops possible, continued to arrive. As a result, native pastoralists were evicted from their land, often by force. In 1795 Britain occupied the Cape Colony making Cape Town its military headquarters for the region. By 1806, the resident population of Cape Town had climbed 16,500, of whom 10,000 were slaves. The city’s slave population was primarily imported from other regions of Africa. After the abolition of the slave trade in 1808, the number of slaves in the city steadily declined, and by 1840 Europeans were the majority. 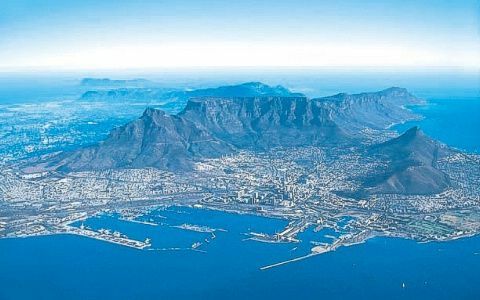 The port proved to be the city’s primary economic base, and when diamonds and gold were discovered inland in the second half of the nineteenth century, Cape Town became one of the primary entry points for the new wave of immigrants. In the 1890s, many native Africans began to move into Cape Town. Early Cape Town had a reputation for racial tolerance and based the franchise on property ownership as opposed to skin color. Despite this, in 1901 the first notable segregation was imposed when black Capetonians were relocated outside the city center to Ndabeni. In 1910, Cape Town became the seat of the Union Parliament though the political center of the Union of South Africa would remain in Transvaal to the northeast. In the first half of the twentieth century Cape Town began to industrialize. By the end of the Second World War, this industrialization had helped to trigger another wave of urbanization. New residents of European descent settled in different areas from those of African descent. In 1948, the National Party, which had a state platform of apartheid, was voted into power and what had been informal segregation now became national policy. By 1966, District Six in Cape Town was declared the largest area of exclusive white residence and many non-whites were forcefully evicted. In February 1990, Nelson Mandela made his first speech after being released from prison from the balcony of Cape Town’s city hall. Despite the introduction of democracy, Cape Town continues to experience social problems such as gang related violence, resistance to full integration, and ethnic and racial factionalism, and poverty. Catherine Besteman, Transforming Cape Town (Berkeley: University of California Press, 2008); Christopher Saunders, Nicholas Southey, Historical Dictionary of South Africa (Lanham, Maryland: Scarecrow Press, 2000).